2) 예매페이지의 팬카페 인증창에서 팬카페 회원인증을 먼저 받아놓으시면 빠르게 예매가 가능합니다. 3) 인증 시 이름, 다음 아이디, 휴대폰번호로 인증 가능하며, 정회원 신청 URL 내 기재한 정보 그대로 인증하시면 됩니다. 4) 한 번 인증한 아이디는 재 로그인 시 다시 인증하지 않아도 됩니다. ‘본 계정은 인증된 계정입니다.’라는 팝업이 뜹니다. 6) 선예매 인증이 되지 않는 경우 공식 팬카페 ‘정회원 인증문의’ 게시판으로 문의하여 주세요. 이후 오픈되는 일반 예매를 통해 티켓 예매가 가능하오니, 꼭 기간 내 인증을 완료하여 주시기 바랍니다. 1) 팬카페 인증 및 선행 예매는 웹/모바일 모두 가능하며, 글로벌 페이지는 영문 버전만 가능합니다. 2) 인증 이전에 정회원 인증 신청 시 기재한 본인의 이름, 다음 아이디, 휴대폰번호를 확인하여 주세요. ※ 인증 기간 중 팬카페 가입 정보 수정은 불가합니다. 3) 국문 페이지에서는 핸드폰 인증을 통한 본인인증이 완료된 옥션아이디(정회원)로만 팬카페 인증 및 예매가 가능합니다. 4) 한국 핸드폰번호로 본인인증이 불가 하신 경우, 한국어 페이지에서 팬카페 인증을 하셔도 티켓 구매는 불가하오니 주의해주세요. 5) 한국 핸드폰번호나 외국인 등록번호가 없다면, 반드시 영문 웹페이지를 통해 팬카페 인증과 예매를 해주세요. 6) 팬카페 인증을 옥션티켓 국문 페이지에서 진행했을 경우, 선예매 역시 옥션티켓 국문 페이지에서만 가능합니다. 7) 팬카페 인증을 옥션티켓 영문 페이지에서 진행했을 경우, 선예매 역시 옥션티켓 영문 페이지에서만 가능합니다. 8) 티켓 예매 이후 정해진 기간 내에 입금을 하지 않을 경우 해당 티켓은 자동으로 취소됩니다. 옥션티켓 아이디 소유자의 이름과 팬카페 인증자의 이름이 달라도 인증이 가능합니다. 10) 본인의 이름, 다음 아이디, 휴대폰번호 외 타인의 정보를 이용하여 인증할 경우, 법적인 책임이 따를 수 있습니다. 12) 팬카페 선행 예매는 6월 11일(월) 낮 12시부터 14일(목) 낮 12시까지입니다. 3) To make your authorization, enter your Name, Daum ID and Contact Number. To make your authorization, enter your Name, Daum ID and Contact Number that was used when registering in the official fan café. 5) A ‘This account has been authorized’ pop-up window will appear when clicking the ‘Fan cafe authorization’ tab for members who have successfully made their Fan cafe authorization. 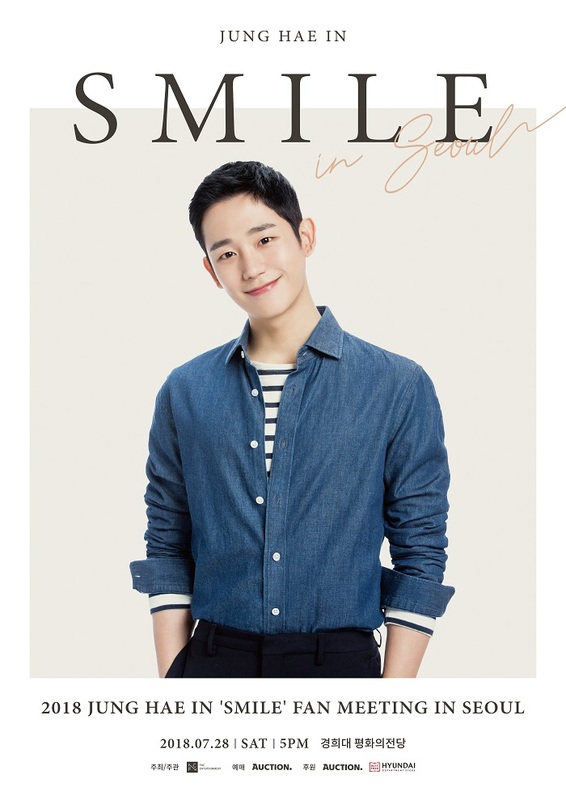 6) Those who have problems regarding authorization please visit the Jung Hae In official fan café and leave your message on ‘정회원 인증문의’ corner. 7) Those who do not make their Fan cafe authorization during the authorization period will not be able to pre-purchase tickets and will need to purchase tickets once general tickets have opened. 1) Fan cafe authorization and pre-purchase will be accessible via web, mobile. 2) Please check your Name, Daum ID, Contact Number that was used when registering before make Fan cafe authorization. ※ Information cannot be edited during the Fan cafe authorization period. 3) In the Korean page, Fan cafe authorization and ticket purchase are possible only if you login with your official Auction ID that has been authorized via your mobile. 4) In the case you can’t make an authorization with a Korean mobile number, please note that ticket purchase through Korean page will not be possible even though you successfully complete your Fan cafe authorization. please make your Fan cafe authorization via the English site. Fan cafe pre-purchase will also only be available via the Korean Auction ticket site. Fan cafe pre-purchase will also only be available via the English Auction ticket site. 8) If payment for tickets are not made within the given period, tickets will automatically be canceled. 9) When logging in to Auction Ticket, only one authorization can be made for each ID. Authorizations can be made even if the name of the Auction Ticket account holder and the name of the Fan cafe member are different. 10) In the case you use another’s Name, Daum ID, Contact Number or any other information to make an authorization, you may be liable to take legal responsibility. 12) Fan cafe pre-purchase tickets are available from June 11th, 2018 (Mon) 12PM ~ June 14th, 2018 (Thu) 12PM.